Hey There! It's Kim from the Fotobella Design Team. I have been working on a very special project that I wanted to share with all of you. It is a tribute page for four extraordinary ladies in my life, my best friends. These amazing women have touched me deeply at different points in my life but they have left a lasting impression on my heart. They have stood by me through thick and thin, through some of the toughest times in my life. They give of themselves freely and expect nothing in return. They know the true meaning of friendship. Some of them live close. Some live far. One even lives in a different country. But no matter how far apart we live or how long it's been since our last conversation, we can pick up phone and never miss a beat. 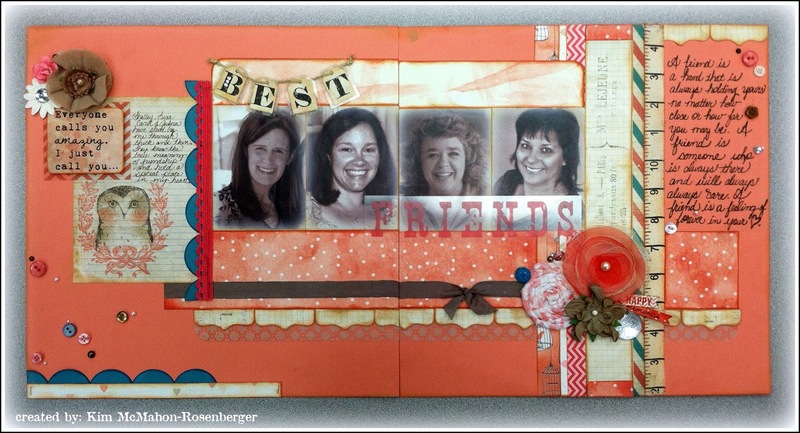 I just love the Hello Friend collection double page layout kit by Glitz Designs from Fotobella.com. It was perfect for the project I had planned. The kit comes with beautifully printed double-sided papers from the collection, layered stickers, title stickers, paper layers, peek-a-boos, paper garland & washi tape (my favorite). There is so much in this kit, you will be able to complete this double page layout and still have tons of project left over. To complete the layout, you will need to purchase the kit from Fotobella.com. I added a few sheets of cardstock (coral & teal blue), some flowers, ribbon, twine, elastic, buttons, rhinestone gems & pearl gems. I also used the Bracket Tab Punch and the Circle Tab Punch by We R Memory Keepers (also available at Fotobella.com). I am simply addicted to these! Just a quick tip, think outside of the box when it comes to your supplies & embellishments. Listed below are a few techniques I used on this layout. On the left hand page, I cut down a portion off the title sticker to fit my needs (I removed the words "mine"). I cut apart some the peek-a-boos and used them as mats (coral chevron behind title & also white print behind letters) and also as a border along the bottom third of both pages (white print cut into 3/4" strips and then laid end-to-end). I used elastic dyed with a mist as a border and I cut out the letters from a paper layers page to form the word BEST. On the right hand page, I formed the background borders by using (l to r): 1. paper strips cut from a paper layer (birdcage print) 2. patterned paper 3. washi tape 4. grid patterned paper but I covered up with diagonal striped border with the coral dot pattern paper 5. a border strip cut from the grid paper 6. part of a measuring tape. The Peek-a-Boo word "Friends" was cut to span both batsh and the simple flowers were formed with circles of tulle & the other with a strip of scrap fabric. I used (4) 3" x 4" photos, but the layout will also accomodate (2) 4" x 6" pictures as well. I hope that this inpsired you to pay tribute to some of the important people in your life. Thanks for stopping by the blog today!